Friends of the Lake District is an independent charity and the only membership organisation dedicated to protecting and enhancing Cumbria’s landscapes. We designed a brochure for Friends of the Lake District that appeals for support and aims to generate donations for their key projects. 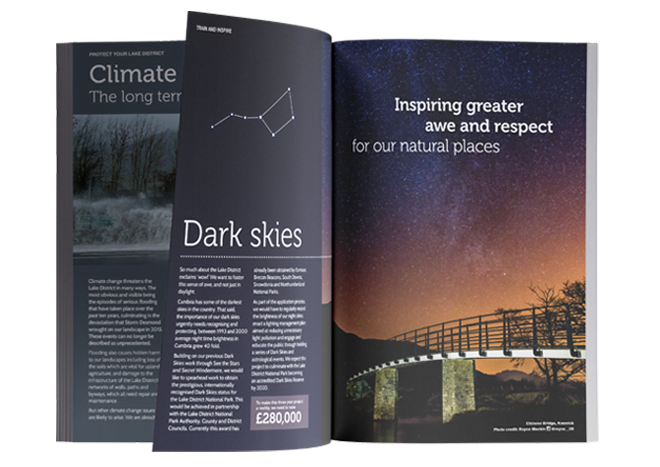 These projects range from protecting the Lake District from the catastrophic effects of climate change to bidding for the prestigious, internationally recognised Dark Skies status. The Appeal for Support brochure uses bold, block colours that compliment the beautiful photography used throughout.